Enjoy a perfect mix of coastal and mountain trails through the "Pearl of the Adriatic"
An undiscovered gem of a place for beautiful walking, Montenegro is perfect for exploring on foot. 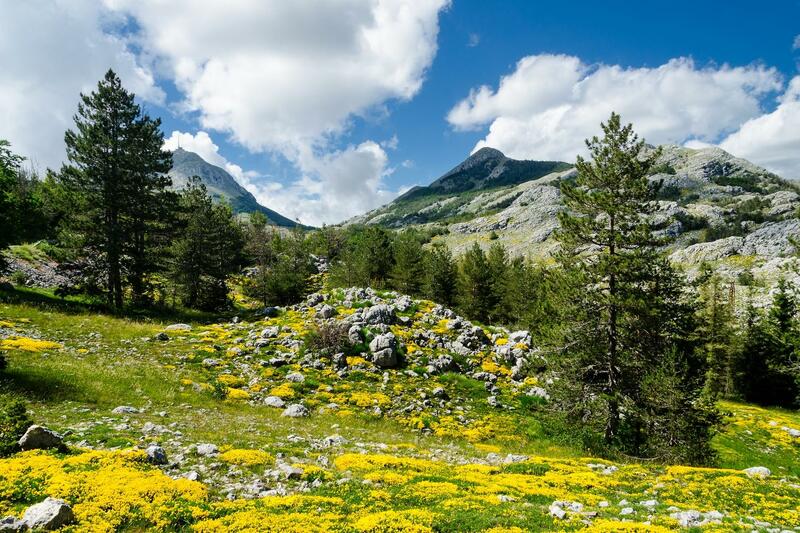 Following quiet shepherd’s trails and old trade routes, enjoy the contrast of invigorating routes through the mountains in Lovcen National Park and walks alongside the sparkling coastline dotted with ancient villages and towns brimming with history. Begin with a couple of nights in the old royal capital of Cetinje with its quirky, colourful streets. 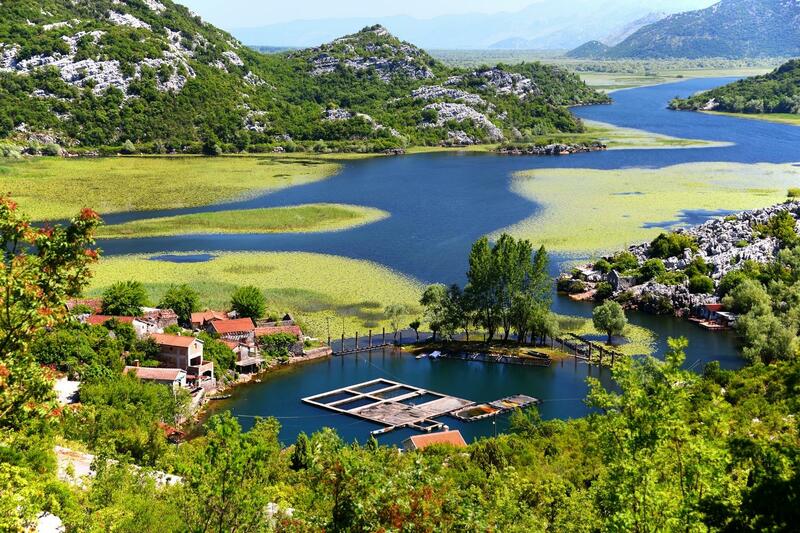 Enjoy a trip to nearby Lake Skadar, rich in birdlife such as the Dalmatian pelican and Pygmy Cormorant. 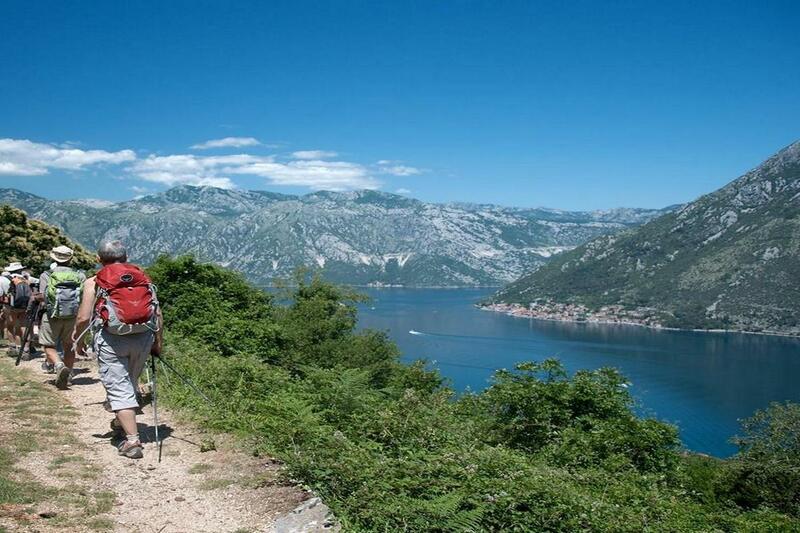 Spend a couple of days walking through the rolling mountains and valleys of the national park before continuing by the old trade route to Kotor for a couple of days of fantastic coastal walking with wonderful views of the turquoise Adriatic. We recommend flying into Podgorica Airport, from where you will be collected by a private taxi transfer and taken to Cetinje (45min). Check in at your small friendly guesthouse before taking some time to stroll around the lovely old royal capital of Montenegro, founded in the 15th century. 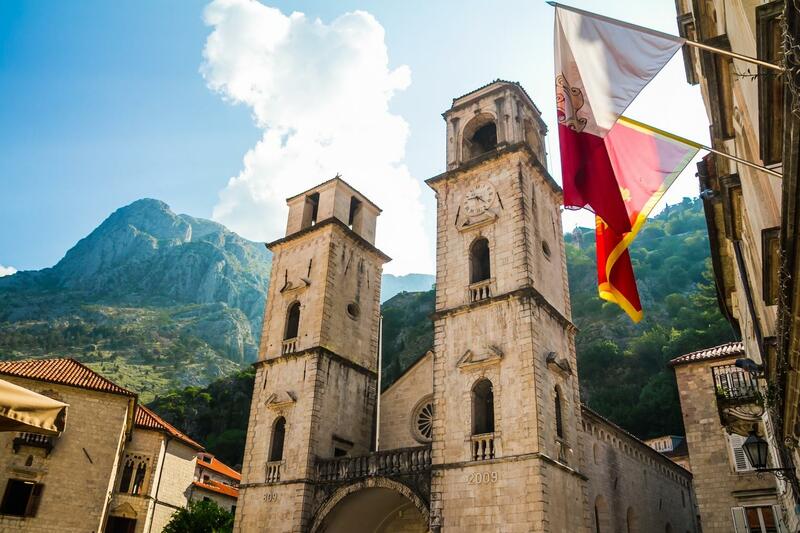 Rich in cultural and historical heritage, there is plenty to see including the royal palace, the grand embassy building and the Cetinje Monastery, destroyed and rebuilt several times over Montenegro’s history. A short transfer this morning (30m) brings you to Karuc, a picturesque fishing village on the edge of Lake Skadar. The largest lake in the Balkan Peninsula, Skadar is very beautiful (legend says it was created by the tears of a pixie!) and home to around 270 different types of birds. These include the White Egret, Dalmation Pelican and Pygmy Cormorant. On arrival, a relaxing cruise (1h) on a traditional wooden boat gliding amongst the pretty lily pads of the lake gets you closer to some of the birdlife and lets you take in some of the lovely scenery. Back in Karuc, a short walk heads past some of the ancient villages in this area with beautiful views of the lake visiting a local producer of delicious Montenegrin wine and honey. Head back to Karuc passing an iconic viewpoint of the Rijeka Crnojevica bridge over Lake Skadar. We recommend taking some time to enjoy some of the local fish specialities in a café in Karuc before a transfer takes you back to Lovcen. Head out of Cetinje and on to an old trader’s route which will lead you through the mountains and valleys of Lovcen, to your next base in Ivanova Korita, in the heart of the national park. Your rustic mountain hotel is a lovely place to spend the next couple of nights with its location in a beautiful valley covered with forests and meadows. Enjoy the fantastic views and sample some delicious Montenegrin food and wine. Walk: 9km, 680m Ascent, 100m Descent, 3 hours. An exhilarating loop walk today from your hotel to the second highest point of the National Park, the Jzerski Summit. 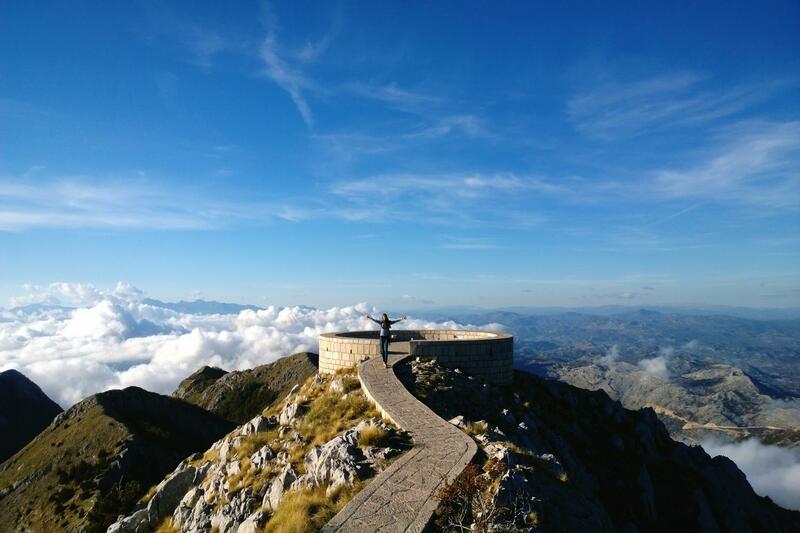 Climb a thigh-burning 461 steps leading to the Njegos monument which sits at the summit to be rewarded with panoramic views reaching as far as Kotor Bay in the south, the Albanian Alps in the east and Skadar Lake. Visit the atrium and the crypt before making your way back to your hotel. Head towards the Adriatic, continuing on the old trade route which once connected Cetinje with Kotor, now known as the “Ladder of Kotor”. Take in amazing views towards the Bay of Kotor as you zig-zag down towards Kotor. Continue on the trail past the Chapel of St Ivan, an old catholic church, and the fortress of Castle of San Giovanni, enjoying changing views of the bay the whole time. 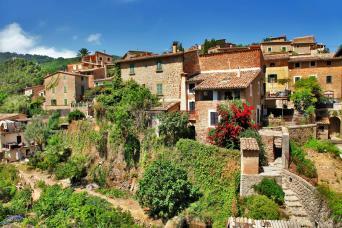 Finally you will reach the walls of the Old Town via a series of old stone staircases. The fortified town of Kotor is a deserved UNESCO World Heritage Site with its Venetian palaces, Roman Catholic cathedrals, Byzantine church, and romantic cobbled streets. Mount Vrmac sits as a barrier between the innermost part of the Bay of Kotor and the outer part, the Bay of Tivat. Your walk starts in the centre of Kotor on the military zig-zag trail named after Austrian emperor Franz-Josef and climbs up to the “Vrmac Fortress” built in 1892. Follow a mountain ridge to the summit (765m) before descending on an old shepherd’s trail to the village of Donji Stoliv. Enjoy a coffee at the seaside promenade before being picked up and transferred back to your hotel in Kotor (15min). Walk: 14km, 695m ascent/810m descent; 4-5 Hours. From the village of Orahovac a meandering trail ascends through forest to the ruins of Vranovo Brdo fortress (743m) for great views of the surrounding turquoise coast. Enjoy a picnic lunch taking in the views before joining another military path down to the small town of Perast. We highly recommend taking a boat trip over to the very pretty “Our Lady of the Rocks” church dating back to 1484 which sits on a manmade island off the coast of Perast. This charming little church has some beautifully intricate alter and ceiling frescoes well worth a look. 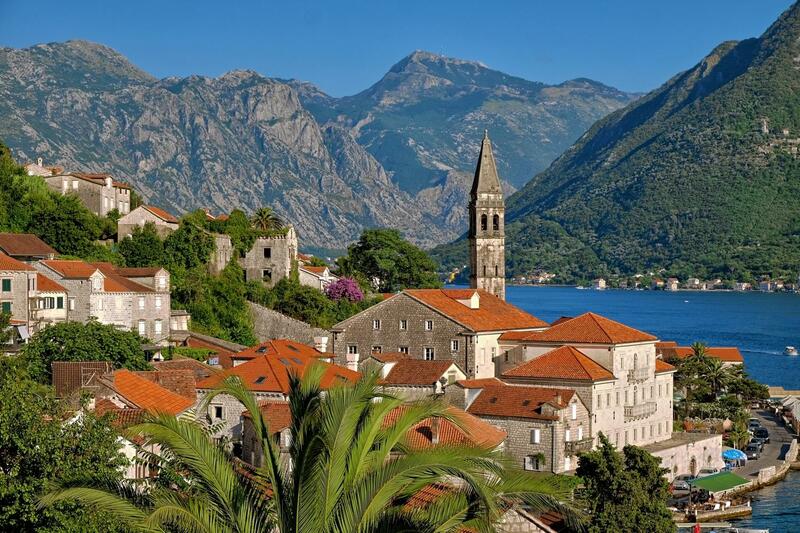 Make your way back over to Perast, where a transfer will take you back to Kotor. (20min). Check out after breakfast and make your way back to either Tivat (15min), Podgorica (1h 50m) or Dubrovnik Airport (2.5h). 7 Nights accommodation is included in your trip. 2 nights are in a small guesthouse in Cetinje, 2 nights in a mountain hotel in Lovcen National Park and 3 nights in a 4* standard hotel in the centre of Kotor. Examples of accommodations used are detailed below. Dependent on availability, similar accommodations of a similar standard may be used and your detailed itinerary will show your exact accommodation. We have chosen Hotel Monte Cristo for its fantastic, very central location in the old town of Kotor. However, being in the old town it can be quite noisy in the evening. If you prefer a hotel in a quieter location, we also use the Babilon Hotel and Restaurant. 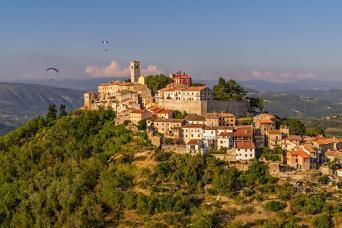 This trip is available to solo walkers although there is a supplement applicable. Single rooms are also available and a single room supplement is payable. 7 breakfasts are included. Lunches and dinners are not included to keep things flexible . You can choose from the many options available in Cetinje and Kotor who serve local Montenegrin specialities. The hotel in Lovcen also has a restaurant serving delicious food!. 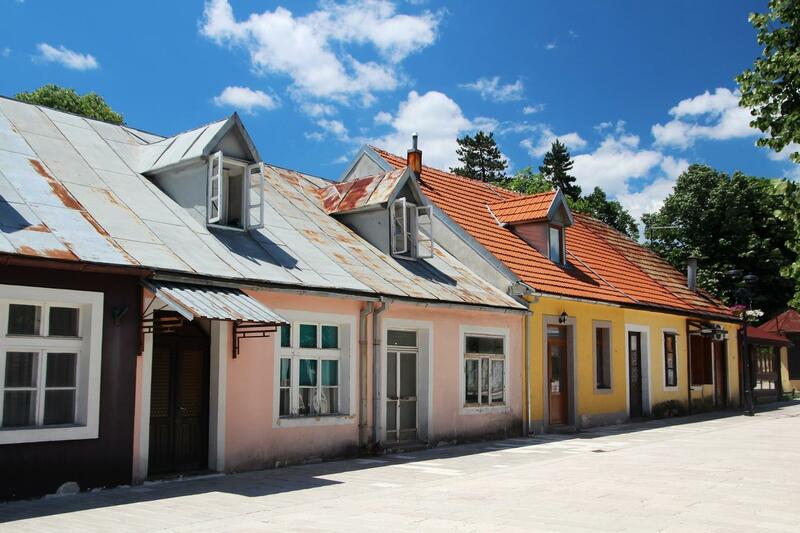 An old traditional house in the centre of Cetinje, La Vecchia Casa is a warm and welcoming family run guesthouse. Breakfast isn't served but they provide eggs, coffee and other breakfast items to make yourself in the kitchen. With its fantastic location in the heart of Lovcen National Park, Hotel Ivanov Konak offers rustically furnished rooms, a lovely big restaurant with two huge fireplaces and wonderful views of the surrounding countryside. Hotel Monte Cristo is a lovely old 4* hotel in the centre of the old town in Kotor. Housed in a building from the 13th century, the rooms are tastefully furnished and you can enjoy breakfast overlooking their quiet courtyard. This small hotel is approximately 3km from the centre of Kotor in the Dobrota area. With its spacious terrace, sea views and private beach area, this is a lovely place to relax at the end of the day, and their intimate restaurant serves traditional Montenegrin cuisine. You can start this walking tour on any day of the week between the beginning of May and middle of October subject to availability. Please note that this tour is only available for departures from the middle of June 2018. 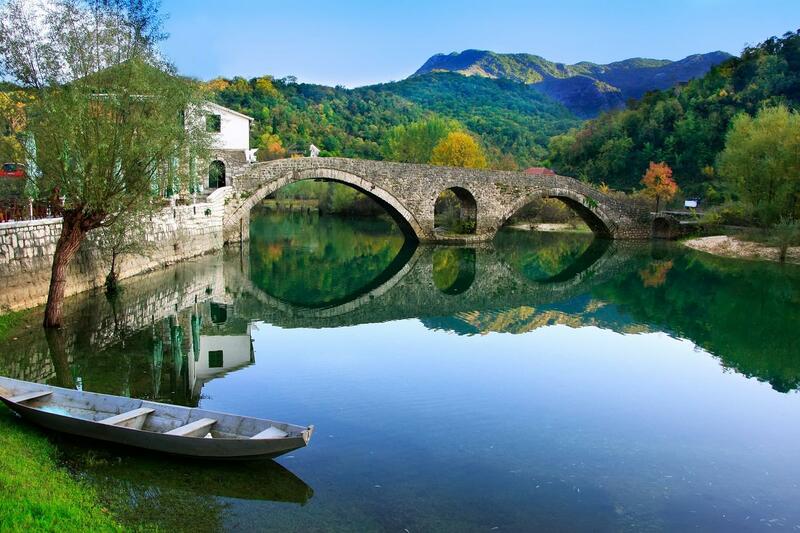 Montenegro enjoys a pleasant climate perfect for walking from May through to October. The coastline has typically Mediterranean weather with very warm summers whereas in the National Park it gets slightly cooler. July and August can get very hot so if you do travel at this time of year we would recommend early starts to the day to avoid the worst of the heat. This trip is graded moderate overall, with the average daily distance being 12km and up to 765m ascent. There are a couple of longer days of around 15-16km. You will be walking for between 3 to 6 hours a day on good military and shepherds trails. There are some short sections on gravel roads and some steep and rocky ascents and descent. On Day 5 when you walk from Lovcen down to Kotor, the path is very narrow and has a sheer drop with some loose terrain, which can be very slippy if it has been wet. It is possible to arrange a transfer to Kotor from Lovcen if you feel like you should not wish to do this day’s walk. Most of the trails are well way-marked and you will be provided with detailed maps and route notes. You will also have access to the Macs Adventure Smartphone App enabling you to follow the route using your phone’s GPS so you will have no problems finding the way. Your bags will be transferred from your accommodation as per your itinerary and moved onto your next overnight stay. We ask you to limit your luggage to one bag of up to 20kg per person. We will always try and accommodate you at the locations detailed in your itinerary. Occasionally, because of limited availability, there is the option to be accommodated at an alternative location. In the unlikely event that we have to accommodate you elsewhere we will advise you of this before confirming your booking. By Air - The closest airport to Cetinje is Podgorica and this is where we recommend flying to. From the UK you can fly from London to Podgorica with airlines like Ryanair or TUI. From Europe, other airlines flying to Podgorica include Turkish Airlines, Austrian Airlines and Air France amongst others. From Podgorica a private taxi transfer is included to take you to Cetinje (approx 45min). It is also possible to fly to Dubrovnik Airport in Croatia, from where you would take a shuttle to the centre of Dubrovnik and then another two buses to Cetinje via Herceg Novi (3.5h in total). By Road: It is possible to drive to Cetinje from the coast via the E65/E80 and M2.3 roads (approx 1h 10m from Kotor). By Air: The closest airports to Kotor are either Tivat Airport or Dubrovnik Airport in Croatia. There is no public transport from Kotor to Tivat Airport but we can pre-book very reasonably priced airport transfers for you in advance which would take approx 20 minutes. Airlines flying to Tivat from the UK include Easyjet and Montenegro Airlines. To get to Dubrovnik Airport, you would take a bus to the centre of Dubrovnik (once daily, 2h) and then a shuttle bus to the airport (30min, hourly departures). There are many flights to Dubrovnik from both the UK and Europe. We can also arrange private transfers from Kotor to Dubrovnik airport for an additional cost. Please select the required option when making your booking or ask one of our D&A Specialists for details. We suggest you book as soon as your plans are finalised as the region is extremely popular and the accommodations do get booked up quickly. However, we will always try our very best to accommodate your plans. This trip is graded moderate overall, with the average daily distance being 12km and up to 765m ascent. There are a couple of longer days of around 15-16km. You will be walking for between 3 to 6 hours a day on good military and shepherds trails. There are some short sections on gravel roads and some steep and rocky ascents and descent. Your detailed information pack will be sent to you after you book. This has a detailed equipment list which includes standard walking gear such as good walking boots or shoes, waterproof clothes and a day pack. Our first walking holiday and definitely won't be our last. This is something we now plan to do as it was the most perfect way of seeing a country and its people. Their local travel partners were outstanding, efficient and extremely friendly, with nothing being too much trouble. Travelling in September meant it was quiet but any local people we met were always kind and helpful. This was an exhilarating, sometimes, challenging, but always highly enjoyable trip. Highlights included finishing a walk at a vineyard in the middle of nowhere, being greeted with a magnificent spread of local produce for lunch watching traditional methods of wine/grappa production, to finishing the trip in a perfect small hotel right on the clear water's edge of Kotor Bay. Just the most perfect experience from lakes, mountains, national park to the coast and can't think how we can top it. Hopefully, Mac's Adventure will come up with something for next year. 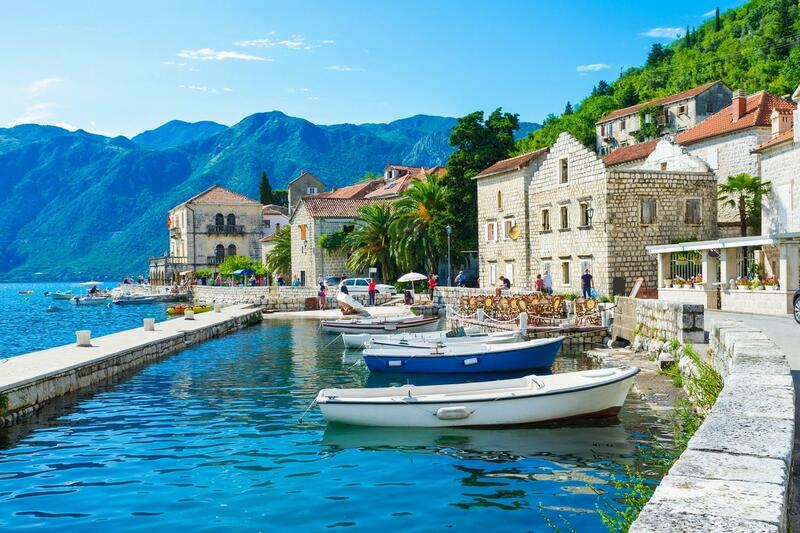 Perfect if you have perhaps sampled the delights of neighbouring Croatia, and want something similar, Montenegro is often dubbed as the new “Pearl of the Adriatic”. 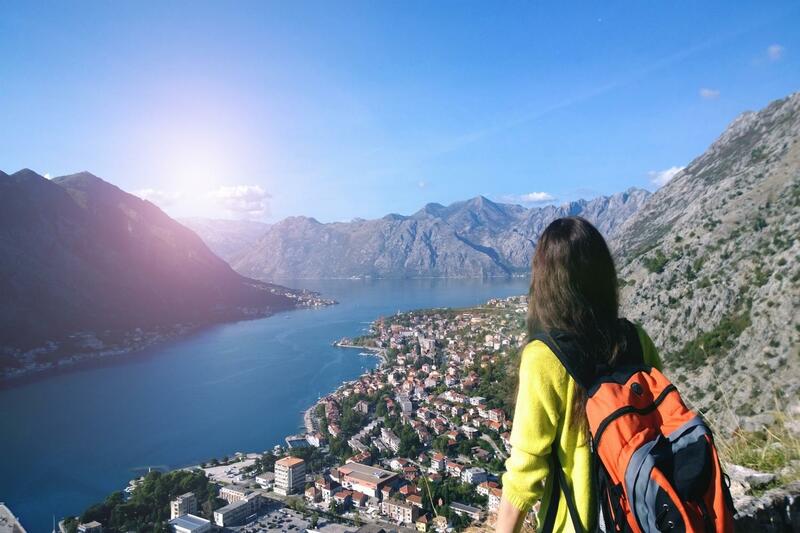 Walking for between 3 and 6 hours a day on good trails with some steep and rocky ascents and descent, you will stay overnight in a combination of simple guesthouses, a mountain hotel in Lovcen and a 3* hotel in the old town of Kotor.